The impact of fracking on the environment and health in Europe is disproportionate to the gains derived from this drilling method, a new study says, adding that its cost effectiveness is also under question. “We should not compare the conditions in Germany with those in the United States,” said Werner Zittel, the author of the study released by the Energy Watch Group, an international network of scientists and parliamentarians, ascitedby the EurActiv. Zittel says that Germany is much more densely populated than the US, adding this increases risks for both the environment and people near fracking sites. The report says that severe environmental damage is seen in the US due to fracking, where the technique is widely used. Scientific studies have proved that the method is closely linked to earthquakes, which have recently increased in some parts of America where fracking is rife. However, human and environmental hazards aren’t the only disadvantages of this questionable method of extraction. According to the president of the Energy Watch Group, Hans-Josef Fell, its cost effectiveness is also a matter of debate. “Unlike in the United States, which is the only country conducting fracking at a commercially relevant scale, the method cannot achieve a sufficient result from extraction in Europe,” Fell said. “It is completely incomprehensible that government policy in support of fracking predominates from Brussels to London and all the way to Berlin, at the burden of environmental protection and against the will of the population affected. Meanwhile, this behaviour is putting more and more pressure on the expansion of renewables,” Fell said. 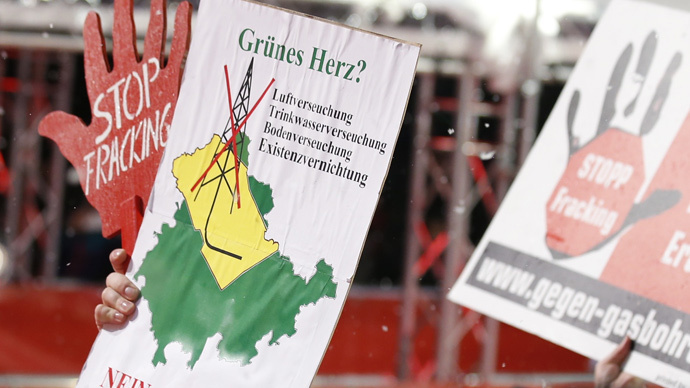 Hubertus Zdebel, an environment specialist for the Left Party in the German parliament, believes big energy companies will be the only ones to gain from fracking. These energy giants “have declared a race for shale gas and have already divided up entire regions among themselves,” he said. Fracking, or hydraulic fracturing, is a controversial technique that includes drilling for fossil fuels using water, sand and chemicals under high pressure through drill holes to blast open shale rock. Opponents argue it has been linked to groundwater contamination, heightened earthquake activity, exacerbation of drought conditions, and a variety of health concerns for humans. The recent report comes a month after Berlin proposed a draft law to allow commercial shale gas fracking at depths of over 3,000 meters. A vote on the draft in the Bundestag will take place in May. If passed the legislation would only concern fracking of shale oil and tight gas in water protection and spring healing zones. “It is important to have a legal framework for hydraulic fracturing as until now there has been no legislation on the subject,” the president of Germany’s federal environment agency (UBA), Maria Krautzberger, said. Germany is estimated to have up to 2.3 trillion cubic meters of shale gas reserves. Under the current fracking ban, there has been a decline in domestic production. If fracking is allowed, domestic natural gas production could go up, with fuel and electricity prices going down in Germany, which has some of the highest electricity costs in the EU.